Holtzman Corp. is the largest oil company in the Shenandoah Valley, and services residents, businesses, and agricultural leaders throughout the area. In fact, they supply gasoline to over 150 stations through the Shenandoah Valley, Northern Virginia, West Virginia, and Maryland. And one of those stations – the Liberty Truck Stop in Harrisonburg, VA – in in the process of getting a bit of a face lift. 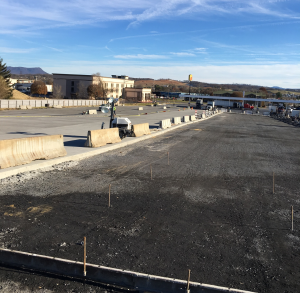 The company made the decision to mill the existing asphalt pavement at the truck stop and replace it with concrete. 10,000 cubic yards of concrete to be exact. After a formal bidding process, VRMCA member Rockingham Redi-Mix was selected to supply the concrete. They’ve made great progress on the project so far, having placed approximately 1,400 cubic yards to date. The new concrete pavement is a 4500 PSI straight cement mix with macro-fiber reinforcement TUF-STRAND MaxTen at three pounds per yard, supplied by Swope & Associates. The company is targeting a March 2019 date for completion.